In the words of U2: “I still haven’t found what I’m looking for”. 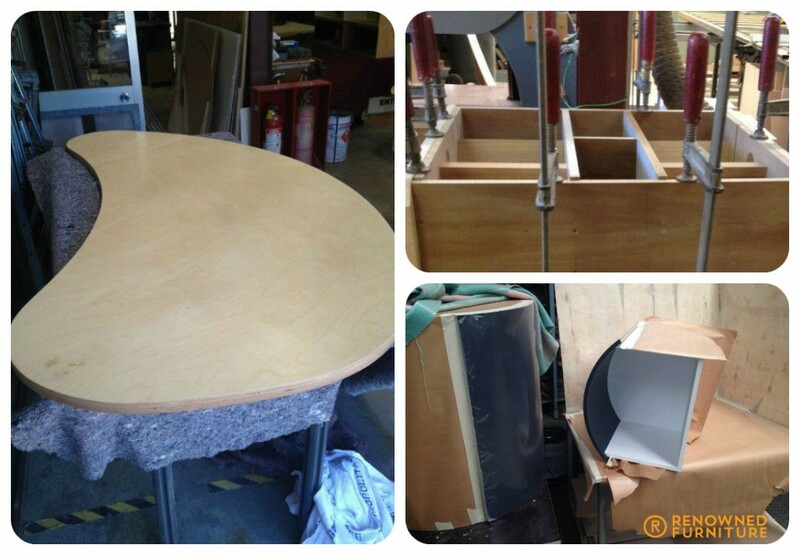 Craig has started a progressive HR consulting company and wanted his furniture to start to reflect his business model. After several discussions and with Craig’s input, a collective design was agreed to. 4 weeks later, Craig, his wife and colleagues were certainly struck by the “wow factor” and were definitely lining up for more pieces. The team at Steel storage Australia were looking for a fresh new set of ideas for their new complex fit out on the Gold Coast. Renowned were contacted through our web site and we sat down with their designers and ours to arrive at the suite of furniture you see here. 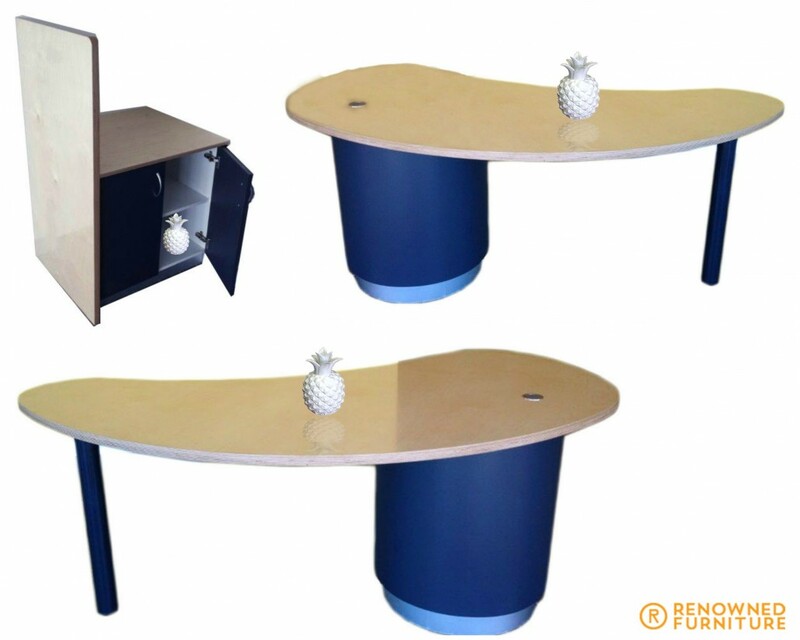 a large sharedesk (hot desk) made from 32 mm thick birch ply on a fabricated round steel frame powder coated in the same colour as the round desk pedestals forvisitors to the “self-storage facility” and corner managers desk made out of 25 mm Birch ply. There is also a matching printer/photocopier cupboard with charcoal doors and birch ply divider and top. 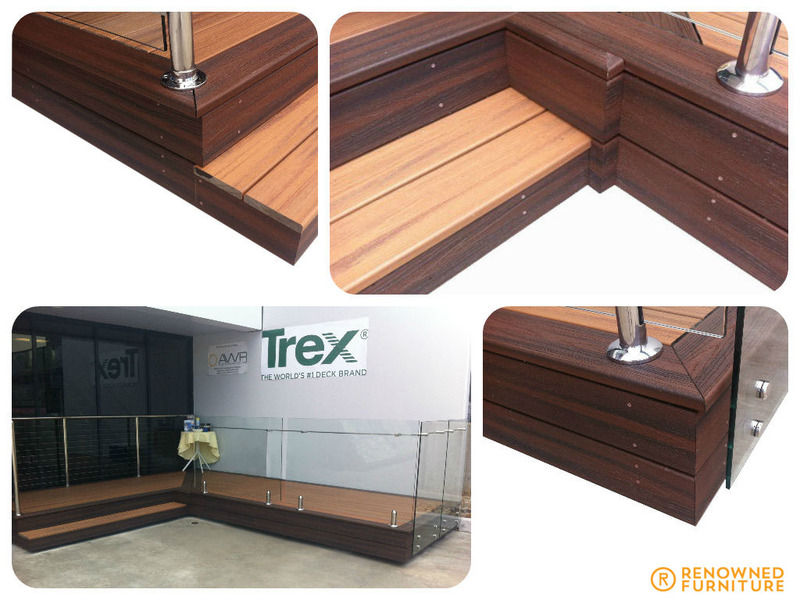 Renowned were contacted recently by a company that imports a “wood alternative decking” material called Trex. Our fine skills and special timber jointing technology were enlisted to help build a display deck at the front of the AWS warehouse for sales evenings and demo displays.. Naturally, it had to look perfect so Renowned’s craftsmen got to go on an ‘out of the ordinary’ field trip to assist the guys at AWS with their new venture. 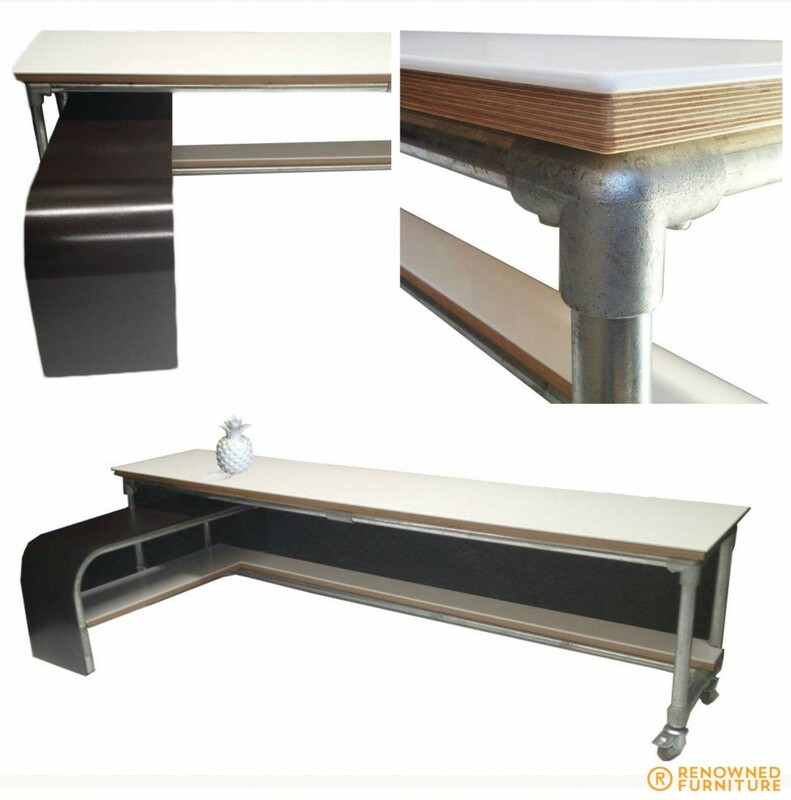 http://renownedfurniture.com.au/wp-content/uploads/2014/07/trex-collage.jpg 768 1024 The Renowned Team http://renownedfurniture.com.au/wp-content/uploads/2014/12/logo1.png The Renowned Team2014-07-21 12:31:082015-03-16 08:18:29The "Trex"
Seven months ago, one of our valued clients, Jason Bird and the Luxxbox Team, won the contract to supply several pieces for the new fit out at the Myer Food Court located at the central city area of Brisbane. 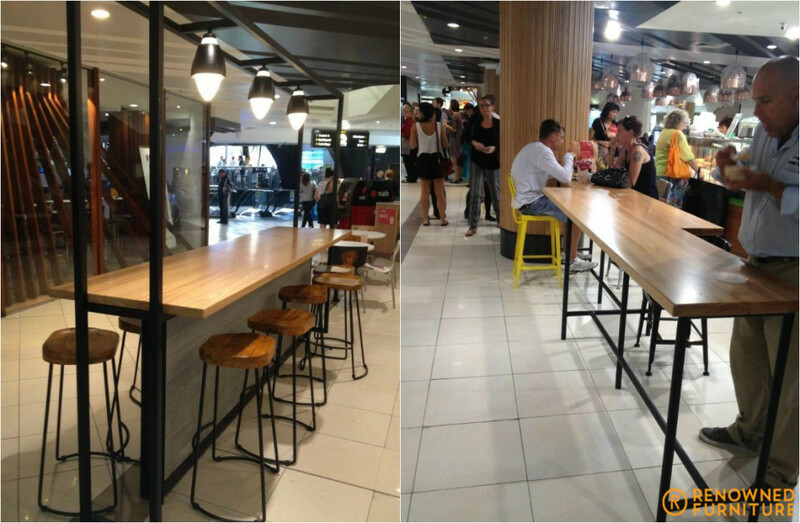 Along with this, Renowned Furniture were commissioned to build the “dry bar tables” as shown on the pictures. 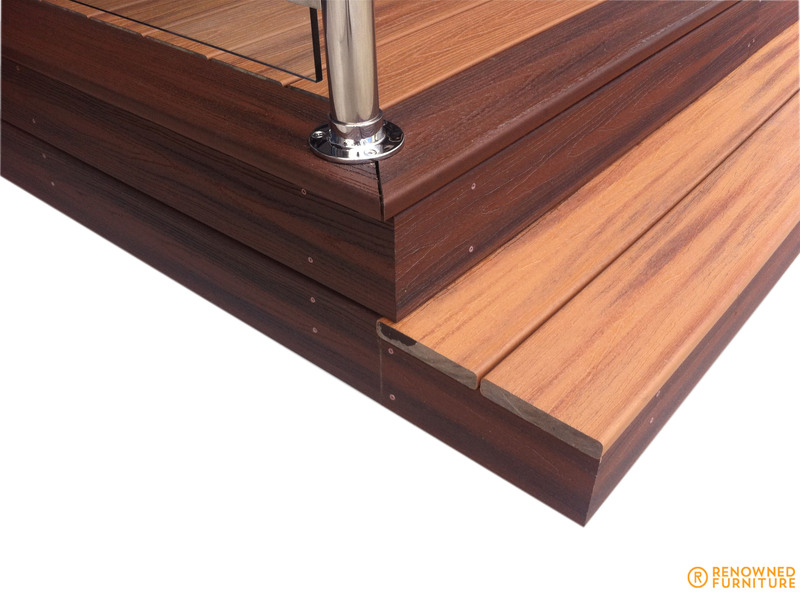 To date, we are still receiving encouragement & positive comments regarding their quality. 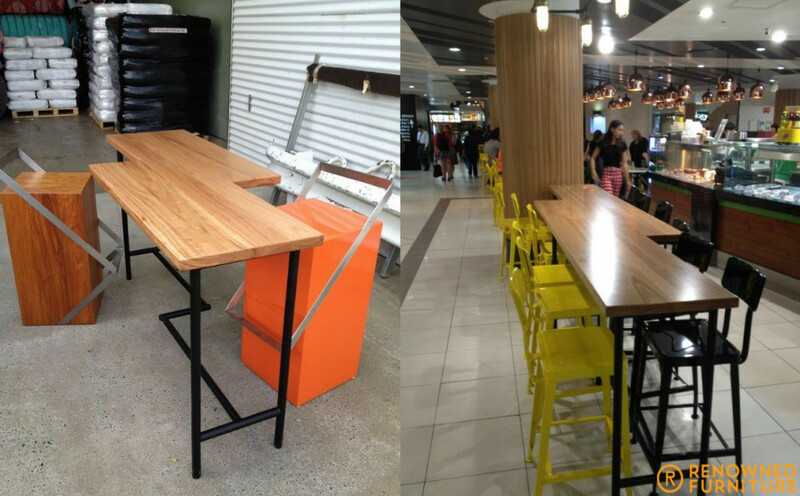 These are made from solid Blackbutt timber on a powder coated steel frame & some pre-wired for lighting. And together with a multi-skilled team, access to a wide network of contractors (that I have worked with for more than 25 years), a principal supplier that knows the commercial design and furniture supply business, we were able to come up with this outstanding end-result! The client runs a shared office space business on the Gold Coast called “Co-Spaces” and had a very important tenant coming in called the V8 Supercars Group. They are one of the icons in Australian Motor Racing. The desks he wanted to design for the V8 guys needed to be unique and have industrial flair for both 2 person & 4 person seating. A collaborative approach to the design between Renowned Furniture & Co-Spaces director, Ben Howe, turned out some cutting edge desks that are one of a kind. We’ve used a highly polished birch ply top framed underneath with hi grade aluminium powder coated in black. 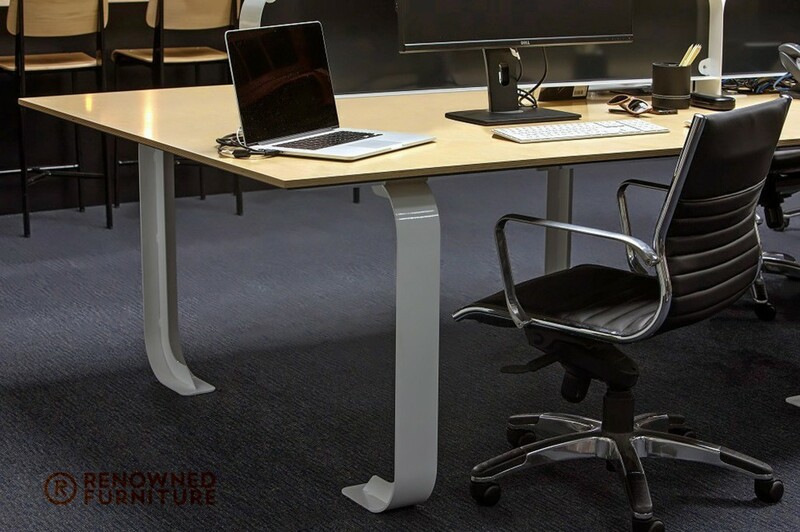 These tops are supported by fabricated steel legs & fabricated steel pigeon-hole pedestal bases all powder coated white. The divider partitions on top to form the 4 operator positions privacy panels are fabricated steel with a black & white powder coat contrast. The finished product gives off a sharp clean appearance with an almost ‘War of the worlds’ like power stance. Very solid pieces.